Incredible images captured the blue flash of light over San Francisco Saturday evening. Incredible photos now give the rest of the world a clearer idea of what Angelenos were freaking out about over the weekend. A spear of blue flashed across the California sky Saturday evening, creating a Twitter tidal wave of conspiracies. But the Navy later revealed the 10-minute apparition was actually a rocket fired from an off-shore submarine near Los Angeles as part of a test. EDDY HARTENSTEIN/AP The flash was caused by the launch of the Trident II missile from USS Kentucky, according to a statement from the Navy. New, clearer images of the event, posted by photographer Abe Blair, show a pointed blue object surrounded by a cloudy ring streaking through the darkening sky over San Francisco, some 400 miles north of the launch. The unexplained flash was the very definition of a UFO. Blair posted the striking images online that capture the mystifying moment, writing that he was shooting night photos with his friend when they noticed the flash. Native Californians were sent into a twitter frenzy after seeing the flash. The true source of the launch – the testing of a Trident II (D5) missile from the USS Kentucky – was not revealed until later, and it had nothing to do with an extraterrestrial invasion. 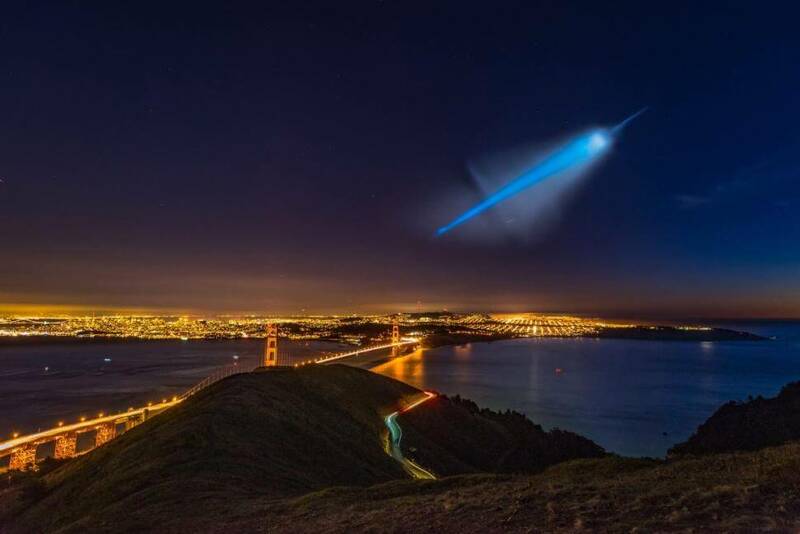 Trident II is a three-stage solid fuel submarine-launched missile, and the blue flash that lit up the sky was nothing out of the ordinary, according to Slate. Viewers initially believed the flash could have been a UFO or a meteor. An expanding ring of gas released during the missile’s staging event could have caused the UFO-like band of light. The missile was not armed, according to a statement from the Navy, and the time of the launch had not been announced to the public. Besides the Twitter frenzy, overnight air traffic patterns were altered Saturday because of activity from a nearby military base, according to the Federal Aviation Administration. The FAA said the change would remain in effect for five nights.